Molded Rubber River Plant Basket | Custom Rubber Corp. Perfect for housing soil and plant life, the CR Hanging Plant Baskets were originally designed to be used in an effort to improve aquatic habitats in the Cuyahoga River. Still in use, the CR Hanging Plant Baskets house plants underwater, and play an integral role in the development of the Cuyahoga River. Along the banks of the Cuyahoga River, these Hanging Plant Baskets can be seen in the recessed sections of the metal walls. hold a 75 to 100 lb. mesh bag of soil and plant life. Molded from a durable recycled rubber, these underwater plant baskets are able to withstand extreme conditions and a harsh marine environment. The shape of the CR Hanging Plant Baskets allows them to fit safely and securely into the recessed sections of the walls lining the Cuyahoga river. This protects the plant life housed inside the CR Hanging Plant Baskets. Another unique feature of the plant basket is the placement of holes along the rubber. 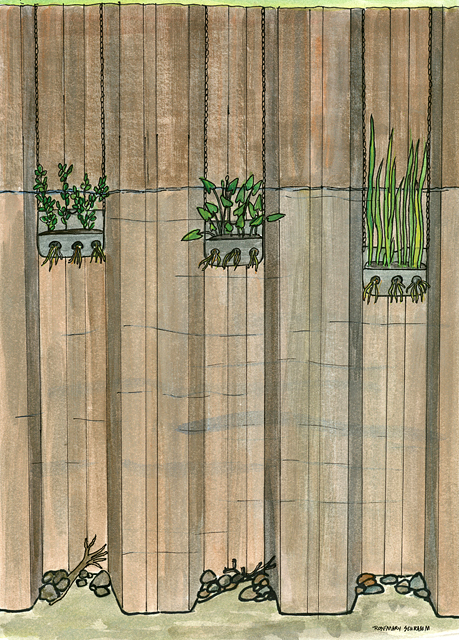 These strategically placed holes allow the plants stems and roots to expand and find shelter. Read the Plain Dealer newspaper article by Joe Frolik. Read the Great Lakes Fishery Commission presentation. Read the Blog Post on Cleveland.com for more information.